New York, New York – so nice, they named it twice. 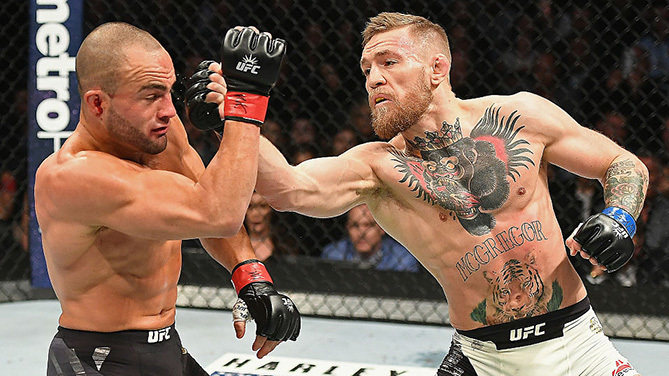 For many fight fans, getting the Octagon in NYC was the true symbol of how far MMA had come since the first UFC event in 1993, and in 2016, the doors were opened for the sport in the Empire State, with UFC 205 at Madison Square Garden on November 12, 2016. As a born and bred New Yorker, I’m fond of telling people that there’s nothing like a big fight at Madison Square Garden. And Georges St-Pierre vs Michael Bisping was a big fight. Forget the high stakes involved. This one just delivered on all counts. 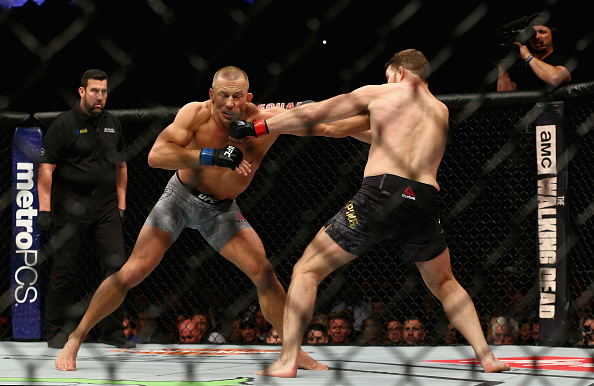 GSP came out and won the first round like it was 2013, not 2017, but then Bisping roared back and had St-Pierre in trouble in the third until the Canadian dropped him and then finished him later in that round. High-level stuff from two of the best in the business. And in the Mecca, no less. You never know what a fighter is truly made of until they hit some adversity. At UFC 205, both welterweight champion Tyron Woodley and challenger Stephen Thompson had to show their true mettle, and each passed their test. In the process, those of us watching from outside the cage got a five-round battle worthy of having the name “world championship” attached to it. Sure, the old sports adage is that a draw is like kissing your sister, but neither Woodley or Thompson deserved to lose this one. A late switch of opponents from Luke Rockhold to “Jacare” Souza didn’t help Chris Weidman in terms of game planning for the UFC 230 bout, but Weidman adjusted well early on against the Brazilian, winning the first two rounds on two scorecards before Souza closed the show in the third stanza, ending the punishing middleweight bout via TKO. Rose Namajunas made it two for two over Joanna Jedrzejczyk in the UFC 223 co-main event at Barclays Center, but she had to go five rounds to get the win the second time around, pulling off a unanimous decision victory to retain her UFC women’s strawweight title for the first time in a bout that was a lot closer than the 49-46 scores would indicate. After nearly two years in the wilderness as he attempted to regain his UFC bantamweight title, TJ Dillashaw finally got his chance against a former teammate in Cody Garbrandt and made the most of it, stopping the previously unbeaten Ohio native in the second round of their UFC 217 co-main event at Madison Square Garden. “This is my belt,” said Dillashaw, who had to get through some significant firepower to defeat his heated rival from the Team Alpha Male gym he used to call home. 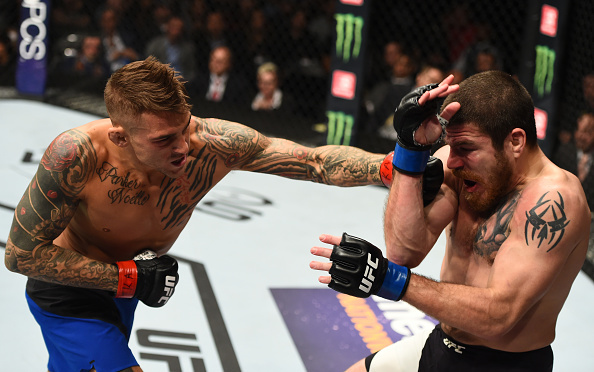 Lightweight contender Dustin Poirier snapped the three-fight winning streak of New Jersey’s Jim Miller as he battled through a leg injury and gutted out a majority decision victory. After a host of decisions on the prelim portion of the UFC 208 card, Miller and Poirier got the main card off to a rousing start, showing off the old school fight game traits that earned the duo fans around the globe. He’s everyone’s favorite rising star, and Zabit Magomedsharipov’s fan base only grew after his three-round win over Kyle Bochniak. No, it wasn’t a “to the wire” fight where the outcome was in doubt after the final horn, but in a fight Magomedsharipov was heavily favored in, Bochniak stayed in his opponent’s face from start to finish, willing to take one to give one, thrilling the fans at Barclays Center and taking a well-deserved Fight of the Night bonus. Unbeaten Khabib Nurmagomedov had hoped to fight for the lightweight title on the UFC 205 card, and while he didn’t get that chance, he most certainly made a strong case for a championship fight with a dominant third-round submission of Michael Johnson that lifted his perfect pro record to 24-0. Johnson set a fast pace to start the fight, tagging the No. 2-ranked Nurmagomedov with several hard lefts to the head. But once Nurmagomedov got the fight to the mat, the future champ took over and informed the fight world that a new king was coming. It wasn’t the biggest fight on the UFC 230 card this past November, but Matt Frevola and Lando Vannata fought like main eventers in the Big Apple, putting on a three-round war that saw both fighters leave it all in the Octagon. And like Woodley-Thompson I, the draw was the only verdict that made sense for a fight with no losers.